Every person's life is built upon stories and patterns that we create and repeat. Alterations happen gradually, occasionally drastically. Then new patterns, new repeats. Approaching these ideas through the constraints of my floor loom and often utilizing historical patterns, my work explores the space between the external landscape of our lives and the internal dialogues that inform our viewing of it. Using weaving as a medium for drawing with fiber, materials and composition are used to evoke a feeling, a passing thought. I'ma self-taught weaver. 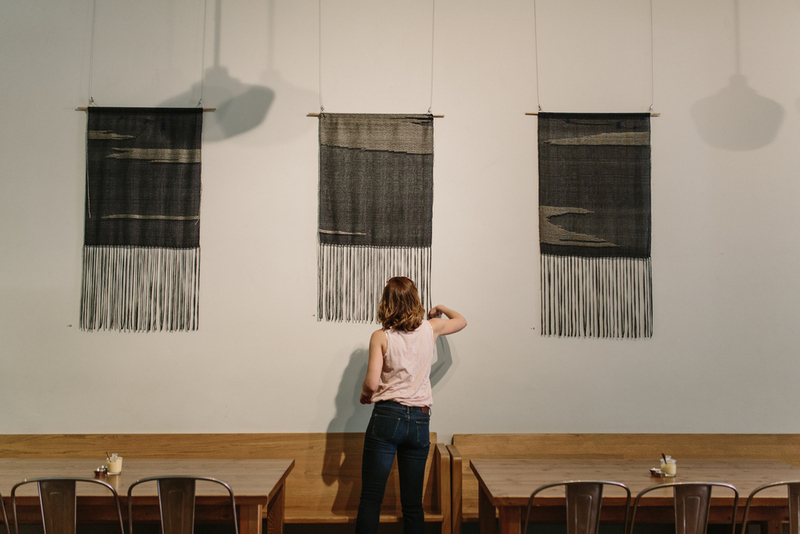 An Ohio native, my crash-course in weaving began upon arrival as an AmeriCorps intern at the Kirkman House, a late 19th century Victorian house museum in Walla Walla, WA, whose volunteers shared a common bond: an affinity for textiles. The most sage of the group were (and are) accomplished weavers and spinners. From here, my love for the loom began. Over the next few years, I purchased every book and pamphlet I could find that fleshed out the intricacies of hereditary patterns and I began the slow process of teaching myself how to warp a loom and weave. In 2012, I formed a business, woven and began making and selling wearable, functional items; cowls, scarves, ponchos and wraps. I found myself wanting to create something distinctly modern and fashionable: using the wisdom of American weavers over the centuries as I created something chic, relevant, and contemporary. In 2015, while continuing to produce wearable items, I began exploring weaving in new ways by stripping away functionality and exploring how to present ideas with fiber. Keeping with my love for traditional patterns and techniques, I’ve begun playing with the idea of how to deconstruct patterns and alter them to create something new. Commissions and pricing available upon request.